This page lets you test your knowledge of the material in the Gases section. Your percentage of correct answers will be presented when you click on the Submit button. You may choose to do this test in Imperial or SI Units by clicking the buttons below. 1. Which of the following are approved for gas piping? 6. What gas piping components may be used inside concealed spaces? 7. Where may gas piping be installed? Gas piping in residential buildings must be painted or identified with banding located no more than 10 feet apart. 11. The remaining questions require you to calculate piping sizes. 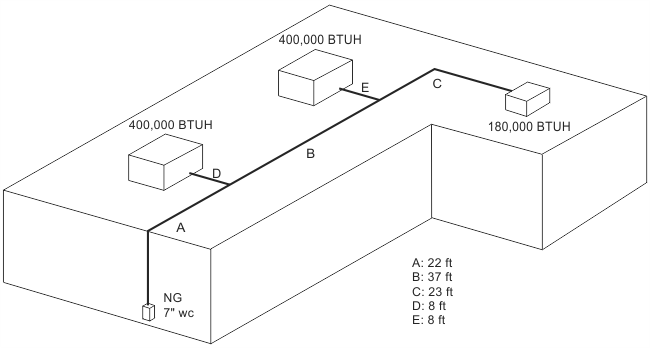 Use the layout and sizing chart provided to calculate each piping section.